This Phase I report describes a preliminary evaluation of a new compaction monitoring system developed by Caterpillar, Inc. (CAT), for use as a quality control and quality assurance (QC/QA) tool during earthwork construction operations. The CAT compaction monitoring system consists of an instrumented roller with sensors to monitor machine power output in response to changes in soilmachine interaction and is fitted with a global positioning system (GPS) to monitor roller location in real time. Three pilot tests were conducted using CAT?s compaction monitoring technology. Two of the sites were located in Peoria, Illinois, at the Caterpillar facilities. The third project was an actual earthwork grading project in West Des Moines, Iowa. 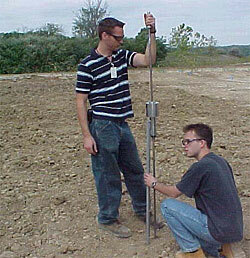 Typical construction operations for all tests included the following steps: (1) aerate/till existing soil; (2) moisture condition soil with water truck (if too dry); (3) remix; (4) blade to level surface; and (5) compact soil using the CAT CP-533E roller instrumented with the compaction monitoring sensors and display screen. Test strips varied in loose lift thickness, water content, and length. The results of the study show that it is possible to evaluate soil compaction with relatively good accuracy using machine energy as an indicator, with the advantage of 100% coverage with results in real time. Additional field trials are necessary, however, to expand the range of correlations to other soil types, different roller configurations, roller speeds, lift thicknesses, and water contents. Further, with increased use of this technology, new QC/QA guidelines will need to be developed with a framework in statistical analysis. Results from Phase I revealed that the CAT compaction monitoring method has a high level of promise for use as a QC/QA tool but that additional testing is necessary in order to prove its validity under a wide range of field conditions. The Phase II work plan involves establishing a Technical Advisor Committee, developing a better understanding of the algorithms used, performing further testing in a controlled environment, testing on project sites in the Midwest, and developing QC/QA procedures.